Flipkart has what it calls “The Big Billion Dollar Sales”. Amazon calls it “Great Indian Sale”, Brick and Mortar businesses give away discounts in the name of everything from New Year to Diwali. Jeff Bezos, the founder of Amazon is quoted as saying that the one thing that will not change in future is of customers wanting lower prices. Even when we know that there is no free lunch and any and every discount has to be somehow made up by marking up, we love cheap prices. What works well for our normal activities unfortunately doesn’t work as much when it comes to the stock markets. When a stock falls, there are a variety of reasons some that could be temporary in nature and some permanent. 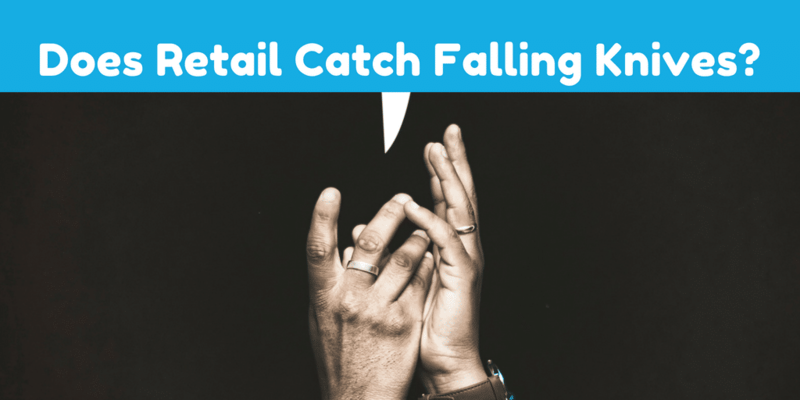 Catching a falling knife is risky for one overestimates his skill and ability to catch it correctly but the converse is that those who succeed are applauded for their risk taking abilities. In the book, Changing How the World Does Business: FedEx’s Incredible Journey to Success # The Inside Story (Link), Roger Frock writes about how facing near bankruptcy way early in the business, Fred Smith, the founder of its business took the last of the money, about $5000 and turned it into $29,000 by betting on blackjack in Las Vegas. That one move gave the company a bit more time and one that helped it survive. But if he had lost that day, we would have neither the company nor the story for who wants to hear about someone who may have changed the world if only his bet in Las Vegas came right. When Investors buy fallen angels, they are anticipating that the stocks while maybe seeing a bad day currently will once back get back to their glory days. Students of financial history know that the truth is that very few companies can recover their glorious past if they have been knocked down by either competition or fraud. We had in the past written about a High Price Stock Portfolio and how that has shown to have an edge in the markets. The strategy doesn’t take any inputs from either the fundamental world or the technical and yet it has shown to be a worthwhile strategy for years. Just the stocks with the highest stock price, that’s a strategy that’s beaten the market consistently. But the retail shareholder seems to do the opposite – buy stocks that have relatively lower stock prices. In the financial year, 2017 – 18, we saw stocks move like there was no tomorrow. Of course, hidden beneath the veil was the fact that not all companies prospered and some stocks prospered with many biting the dust. Retail Investors are generally seen as Weak Hands while Institutions are seen as the strong hands. What this means is that Institutions are the setters of price while Retail are the price takers. Reasons are many but a key reason is the ability of Institutions to do better research than Individuals. That in itself doesn’t mean they will not get trapped, but the probability of failures are lower than that of Individuals. But does data really show this? After all, an adage is that while the small investors are wrong, they are more wrong at the ends rather than being wrong throughout. What this means is that when markets are rallying, retail in itself doesn’t go wrong. Where they go wrong is when market starts to reverse. While professional individuals and institutions start to cut positions, retail lap up stocks like no other. In 1999 – 2000, markets saw one of the biggest boom and bust in stocks of the Infotech sector. Participation by retail was huge and while many lost money, the greatest amount of money was lost not when markets were on the uptrend but when the trend reversed. Rather than cut positions, many actually added viewing the fall as an opportunity. Of course, in hindsight that was the last opportunity to cut and run – but run one barely does. The Aggregates: Does An Increase in Retail Shareholders Matter? We tried to collate data on number of shareholders in an attempt to probe whether the logic of public running after the wrong kind of stocks was true. While there are always companies where we saw number of public shareholders increase even as the stock cratered, one off cases are more of selection bias and hence its necessary to look at the entire database before taking a call. To eliminate stocks with very low liquidity, we analysed the change in shareholding of Public Shareholders (Individual share capital upto Rs. 2 Lacs) where price was greater than 10 Rupees as of March 2018 and Number of Shareholders in 2017 was greater than 5000.
while in case of 601 companies, they ended higher. While markets did top out in January 2018, the returns of both the Nifty Mid Cap 100 and Nifty Small Cap 100 ended on a positive note with gains of 9.07% and 11.55% respectively. 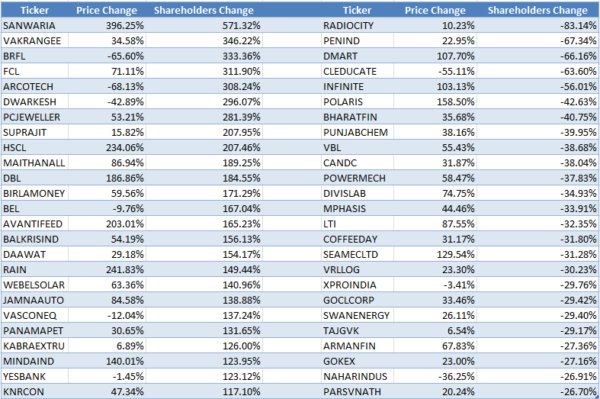 The top 25 list of stocks where the Public Shareholder count has fallen, saw prices go up by (a median of) 33.46% in the last one year. At the same time, the companies where the number of retail shareholders increased quite a bit , we saw a much higher median (53.21) change in the price. 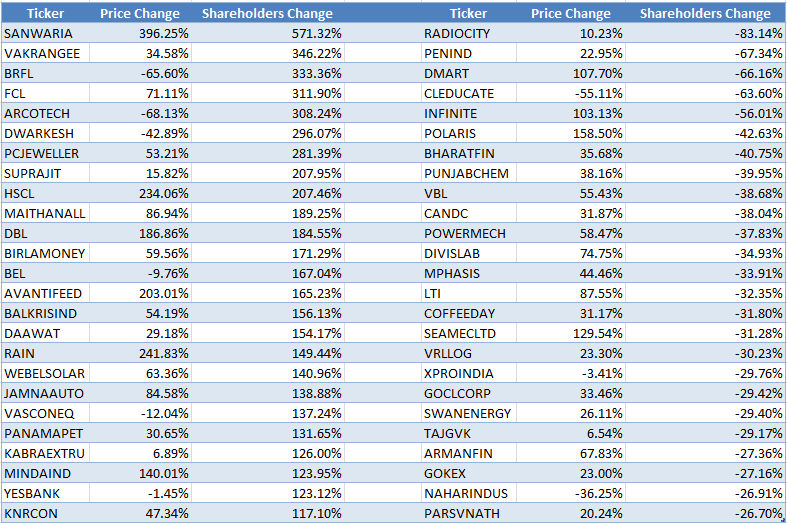 Lets take a look at the 25 stocks where number of public share holders rose and 25 stocks where public shareholders fell. Buying stocks on a dip can be productive if you as the investor have enough data to disprove reasons that lay behind the fall and are willing to wait it out. Unfortunately most of the time, there are real issues in business that means what goes down continues to go down. When the larger trend is up, picking up even low quality stocks can work, but as Warren Buffett has pointed out, Only when the tide goes out do you discover who’s been swimming naked. In late January 2018, there was a report of a scam in a stock that had generated enormous returns in the year gone by. While not many institutions were long in that specific stock, the one fund that did have a position exited the same immediately. Retail investors on the other hand have lapped it up even as the stock continued its downward spiral. The stock is now 90% below its high which means that the stock has to move 930% for it to breach it’s time high. The probability while not zero is so low that one may be inclined to just write it off and move on. Watch out for falling knives. Very few are worth catching for most of the time, the Risk exceeds the expected Rewards.